Over the last few months, The Binding of Isaac: Rebirth has been ported WiiU, PS4, Xbox One, and the New3DS, and with good reason; Isaac was the game that brought roguelikes back in the limelight and in a sense made them a viable indie standby (granted, the quality has to be outstanding). 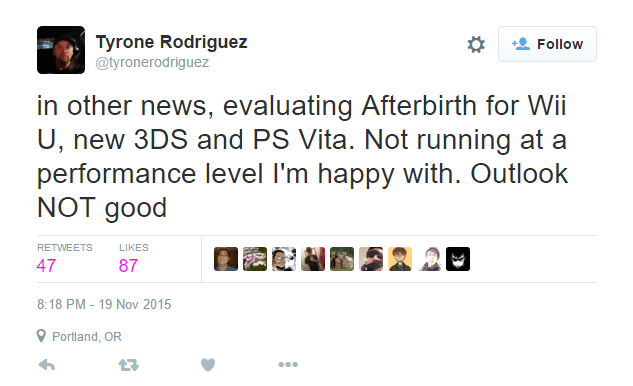 And now, Afterbirth, the game’s recently released expansion, is being ported as well to be added to those consoles in the near future. It would seem that the handheld and WiiU versions of the game are not up to snuff, and it’s looking like they might not come to fruition. At the moment, we do not know if this is due to infrastructure in the systems, or simply a case of lacking the needed power to run the game well. It’s a shame too, I missed out on the Afterbirth pre-order price on PC because I had gotten so used to mobile Isaac. Hopefully this can get ironed out, but the outlook is bleak.